Sorry for the long lapse in stats analysis. It's been quite busy elsewhere and only one person manages the desk at Futbol USA. One of the more important events in the past few weeks is the inauguration of Livestrong Sporting Park in Kansas City, the new home of Sporting KC. Beautiful location and one the national team will remember for a while (just see some comments by Edu, Donovan and Co. at ussoccer.com). In MLS play, the stadium has been sold out and is a welcome sight after years at cavernous Arrowhead Stadium and CommunityAmerica Ballpark (slightly over 10,000 capacity). Because of KC's stadium and the fact that they just now started playing at home, its numbers will look relatively inflated. Remember that it's doubling its previous capacity so crowds will be bigger. 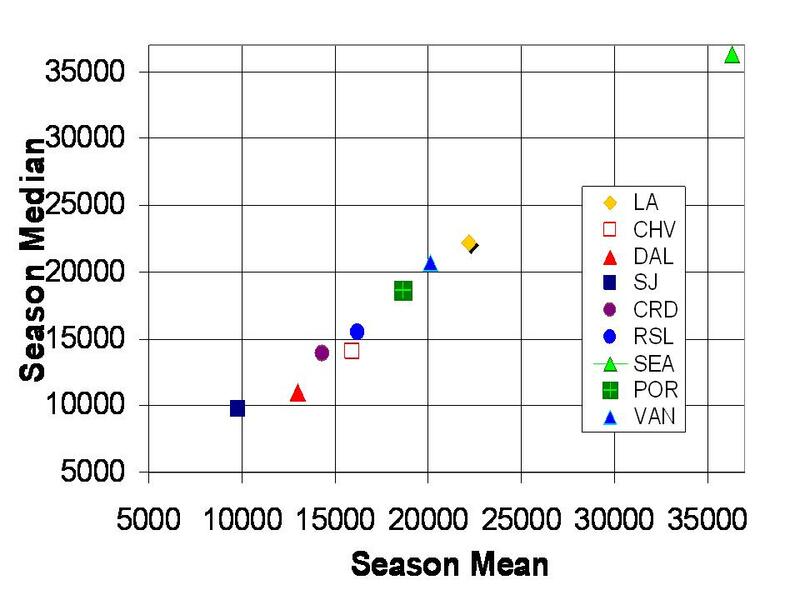 As was posted before, the median of the attendance can now more appropriately be used to gauge the approximate attendance any particular team has had this season. 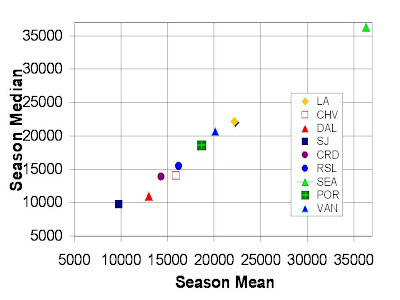 Above is the average - median relationship for the Western Conference. Unlike the East, there is more of a one-to-one relationship for most stadiums. Notable differences are Dallas and Chivas. Dallas had higher attendance for its opening day and when the Galaxy came to town. The same goes for Chivas (sellout at the HDC for the SuperClasico).